Definition: Under the direction of the Superintendent of Schools, the Elementary School Principal provides instructional leadership to staff including: Curriculum planning, review and implementation; professional development; the implementation of all School Committee policies, and the development of administrative systems and procedures which maximize the effectiveness of the elementary school program. Responsible for day-to-day building administration and the safety and welfare of both students, staff and activities. Ensures a safe, pleasant and effective educational atmosphere; provides discipline as necessary and enforces school policy. Essential Functions: The essential functions or duties listed below are intended only as an illustration of the various types of work that may be performed. The omission of specific statements of duties does not exclude them from the position if work is similar, related or a logical assignment to the position. Promotes the learning and growth of all students and the success of all staff by cultivating a shared vision that makes powerful teaching and learning the central focus of schooling. Ensures that all teachers design effective and rigorous standards-based units of instruction consisting of well-structured lessons with measurable outcomes. Instruction: Ensures that instructional practices in all settings reflect high expectations regarding content and quality of effort and work, engage all students, and are personalized to accommodate diverse learning styles, needs, interests and levels of readiness. Ensures that all teachers use a variety of formal and informal methods and assessments to measure student learning, growth and understanding and make necessary adjustments to their practice when students are not learning. Provides effective and timely supervision and evaluation in alignment with state regulations and contract provisions. Uses multiple sources of evidence related to student learning, including state, district, and school assessment results and growth data, to inform school and district goals and improve organizational performance, educator effectiveness and student learning. Promotes the learning and growth of all students and the success of all staff by ensuring a safe, efficient and effective learning environment, using resources to implement appropriate curriculum, staffing and scheduling. Implements a cohesive approach to recruitment, hiring, induction, development and career growth that promotes high-quality and effective practice. Uses systems to ensure optimal use of time for teaching, learning and collaboration. Partnering with middle schools to ensure smooth transitions from grade 4 to 5. Understands and complies with state and federal laws and mandates, school committee policies, collective bargaining agreements and ethical guidelines. Develops a budget that supports the district’s vision, mission, and goals; allocates and manages expenditures consistent with district/school-level goals and available resources. Promotes the learning and growth of all students and the success of all staff through effective partnerships with families, community organizations, and other stakeholders that support the mission of the school and district. Actively ensures that all families are welcome members of the classroom and school community and can contribute to the classroom, school and the community’s effectiveness. Continuously collaborates with families to support student learning and development both at home and at school. Engages in regular, two-way, culturally proficient communication with families about student learning and performance. Addresses family concerns in an equitable, effective and efficient manner. Promote and maintain high standards for staff, students and community members in relation to the Mission Statement and Core Values of the school and district. Provide procedures and protocols that foster a culture of respect and enhance staff morale. Welcome to Spaulding Memorial School! Profile: Spaulding Memorial School has a long tradition of commitment to the elementary school age child. Presently there are approximately525 students who attend the school and a total of seventy-five staff members. The school community is rich with talented and dedicated students, parents, and teachers. There is a strong sense of purpose focused on the unique qualities of this caring early childhood center. This can only be achieved through a collaborative process which includes an active P.T.O., school council, and volunteer program. The educational program offered by the faculty at Spaulding Memorial is a highly effective elementary school program that encourages each child to develop his/her individual talents and abilities in a caring, nurturing, and inclusive learning environment. The curriculum focuses on the Massachusetts State Frameworks for all subject areas. The English Language Arts program incorporates explicit instruction for listening, speaking, reading and writing skills and encourages age appropriate cross-curricular applications. Children are introduced to math through a skills development program, which develops problem-solving techniques and encourages higher-level thinking. Our science curriculum emphasizes a hands-on approach, which fosters observations, inquiry, and understanding. Social Studies emphasizes the understanding of family and community through the integration of literature. To educate the whole child social skills are taught through discussions of citizenship, self-respect, peer relationships and conflict resolution. In addition, children have an opportunity to participate in computer, library, music, art and physical education classes. During the school year the children’s art work and musical talent is showcased at family events. An extremely successful SAFE program is offered to the second grade children by the Townsend Fire Department. To further enhance the educational experience at Spaulding Memorial the PTO sponsors a variety of cultural events, which augment the curriculum. The staff of the Spaulding Memorial is dedicated to the education of each individual child. Our goals are excellence, equal educational opportunities for all and the shaping of the whole child academically and socially. History:Spaulding Memorial School was a gift given to the town by Huntley and Roland Spaulding in the early 1930's. They gave the funding to build a modern school to serve grades one through twelve as a memorial to their parents. Prior to Spaulding Memorial the town had three schools that were crowded, cold and in need of repair. At that time, the advent of Spaulding brought the end of an era of district schools and a new, more united town. The Spaulding brothers ended up spending $250,000 and this was during the depression! 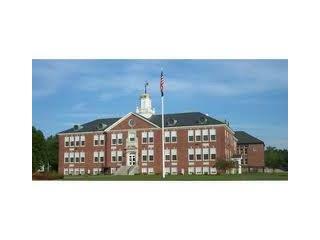 Spaulding Memorial School was dedicated to the town of Townsend on its 200 year anniversary, June 29, 1932. Preceded by the biggest parade in Townsend's history, Mr. Frank Wright, Deputy Commissioner of Education of the Commonwealth, said, "Spaulding Memorial School was the finest, consolidated schoolhouse in the Commonwealth of Massachusetts." North Middlesex Regional School District is committed to maintaining a work and learning environment free from discrimination on the basis of race, color, religion, national origin, pregnancy, gender identity, sexual orientation, marital/civil union status, ancestry, place of birth, age, citizenship status, veteran status, political affiliation, genetic information or disability, as defined and required by state and federal laws. Additionally, we prohibit retaliation against individuals who oppose such discrimination and harassment or who participate in an equal opportunity investigation. Master’s of Education Degree from an accredited college or university is required. Prior experience as an Elementary School Principal is preferred. At least five years of successful elementary school teaching and administrative experience with evidence of strong leadership ability. Selected candidate must be licensed as a Principal/Assistant Principal (Pre K-6) from the Massachusetts Department of Elementary and Secondary Education. Previous administrative experience is required. Ability to work collaboratively towards a consistent district-wide elementary model. Experience with curriculum, including implementation and evaluation of curriculum, staff development programs and provisions of Education Reform Law regarding the role of the Principal. Strong literacy background and fluency with data-driven instruction. Knowledge of special education regulations. Good public relations skills and tangible evidence of ability to relate to pupils, parents, colleagues and the central office administration. Experience with developmentally appropriate social-emotional programs and/or curriculum. Ability to initiate technology integrated with curriculum that is responsive to a wide range of learning styles. Ability to engage students, staff, parents and community members in the teaching-learning process. Performance of this job will be evaluated in accordance with the provisions of the School Committees policy on evaluation. This document shall comprise a portion of the Principal’s performance evaluation. Work Environment: The work environment characteristics described here are representative to those an employee encounters while performing the essential functions of this job. Reasonable accommodations may be made to enable individuals with disabilities to perform the essential functions. Physical Demands: Minimal to light physical effort is generally required in performing duties in an office environment. Attendance at school sponsored events or evening meetings is required.